Within the credit card realm a business verifies that the customer has the requisite funds on their card at the time of payment, and reserves the funds for capture and settlement. In this scenario a business knows for a fact that they are getting paid at the point of sale. When it comes to the ACH sphere, Bank Account Verification allows merchants to mitigate check acceptance risk at the point of sale by providing an opportunity to validate that an account is open and in good standing prior to the account being loaded into a recurring billing engine. This means that data entry errors, potentially closed accounts, or fraud can be caught before finalizing the sale. 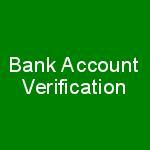 Bank Account Verification prevents newly on-boarded customers from being obligated to do a significant work to obtain correct or valid checking account information. Consider an insurance company binding a policy on first of the month, and has obtained invalid information. The insurance company might not know for over a week that writing the policy was a mistake. What happens if in that week a claim is made? For a small transaction fee they could have avoided a $30,000 loss. Many businesses use third parties to generate new customers. Typically these 3rd parties are paid when the new client is boarded, in many cases the same or next day. What happens if that new customer’s payment fails because of bad checking account data? Again, more friction/financial loss and more potential for losing that new customer. By utilizing a Bank Account Verification system businesses can eliminate a significant amount of the “after the sale” work needed when a payment fails. This process can often save a sale, as payment rejects are accidental the majority of the time . Going through the hassle of the sale process again will undoubtedly cause friction with customers, and a subset of those sales that will be lost. By leveraging Bank Account Verification tools businesses don’t lose hard won customers because of data entry errors. Businesses that rely on future billing are especially vulnerable to bad check data. Using a cutting edge Bank Account Verification Service can dramatically reduce bad check acceptance and the workflow problems they create.